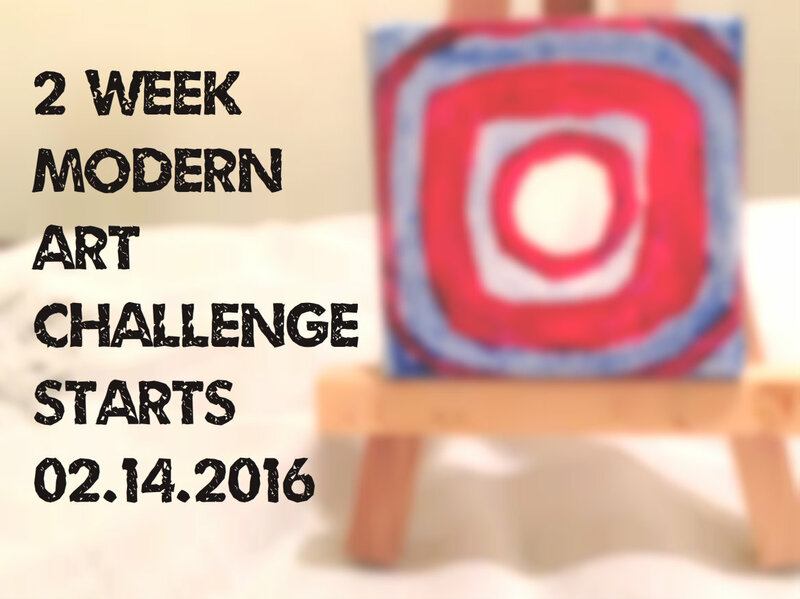 Over the past two weeks, I have had the privilege to work with 50 artists who joined my "2 Week Modern Art Challenge" workshop online. In the coming weeks, I will show you some of my students' work. I could not believe the caliber of the work my students demonstrated. 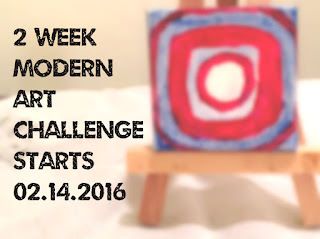 Each Skillshare participant who posted a project has shown fearlessness and resolve to tackle the unknown of painting abstract art. I learned so much from each student's project. Because my students were willing to show their mental and physical processes (sketches, ideas, inspirations, themes), they learned from each other and taught me how to be a better teacher. 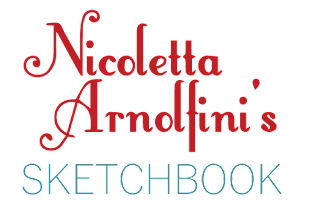 I am looking forward to teaching another Skillshare class soon, again on abstract art. And because of student contributions, I know what new and different techniques to bring into focus in a new class. 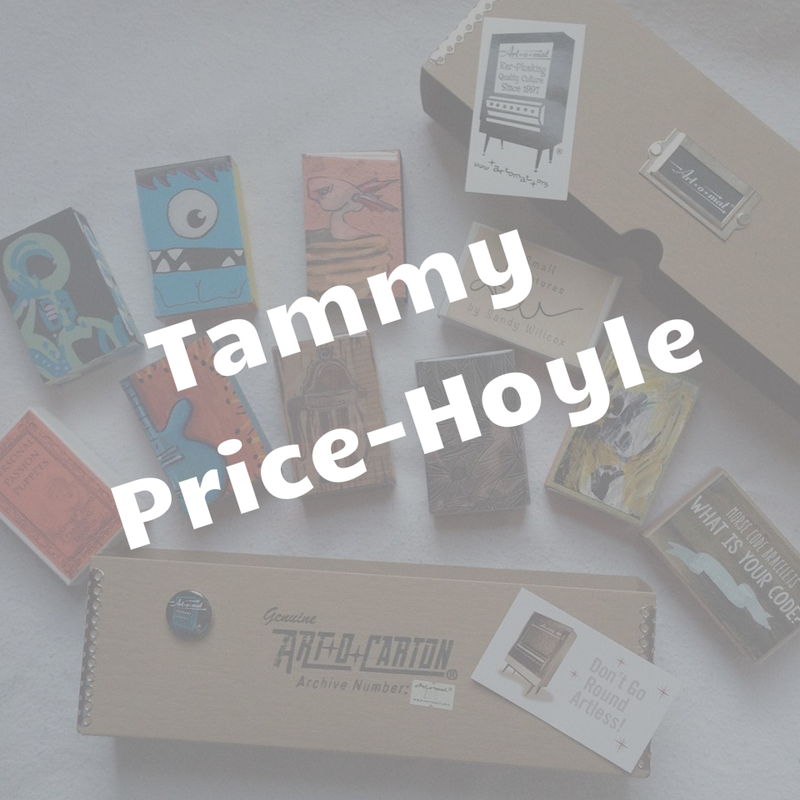 The Art-o-carton ($100 value) goes to Tammy Price-Hoyle. 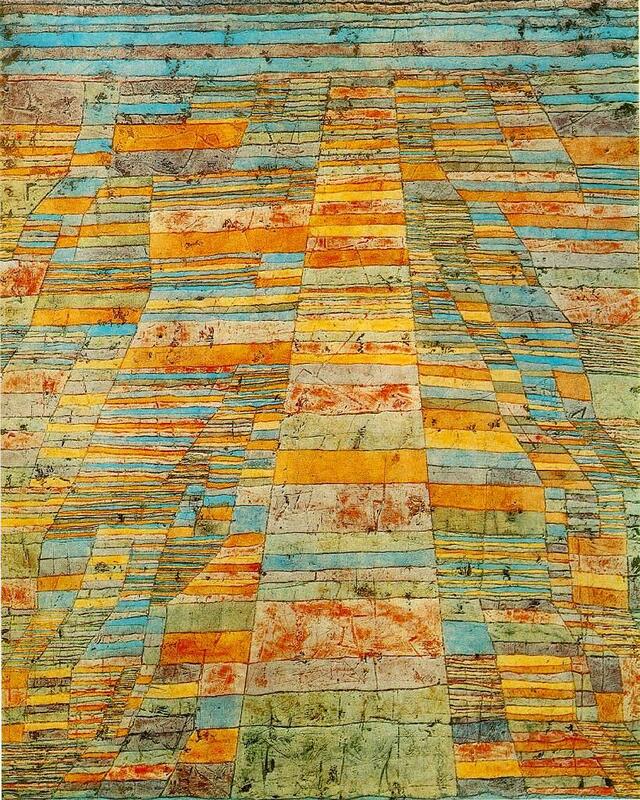 Tammy discussed her artistic influences like Paul Klee and introduced these influences to the rest of the students. She also generously commented on other students' projects. Her support and encouragement helped many others on their artistic journeys in our class. Thank you, Tammy! One $25 gift certificate from P.S. 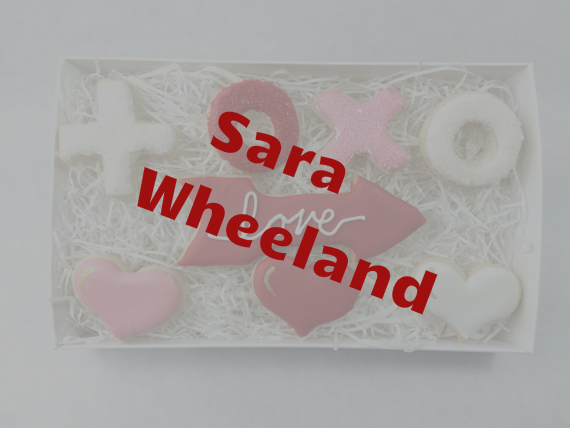 Sweets goes to Sara Wheeland. She produced not just one painting, but 10 finished works. (It's actually 14 if you count her practice works.) Sara demonstrated that you have practice in order to learn. She was willing to discuss her techniques and take suggestions from others. As a result, she was very pleased with her final works. Sara opened herself to take full advantage of this experience. 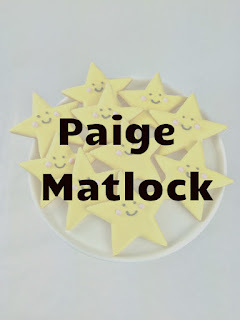 Paige Matlock is the winner of the second $25 gift certificate from P.S. Sweets. 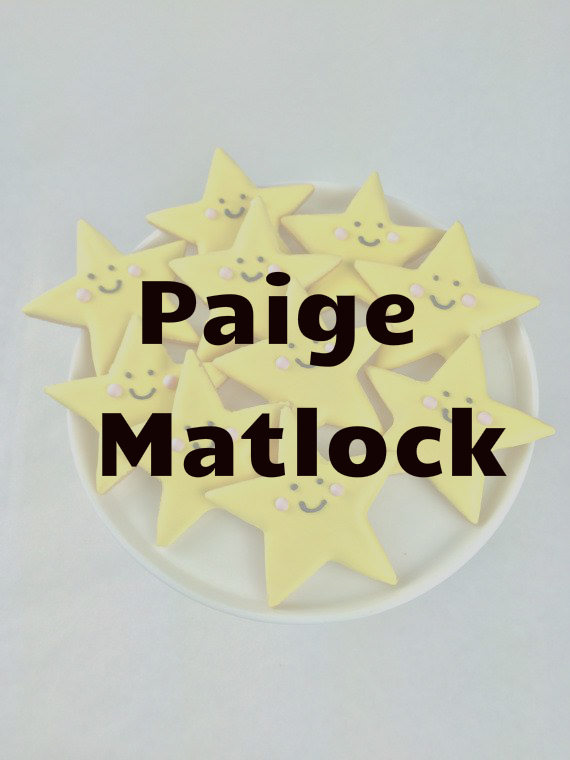 Paige posted her work on her social media accounts and so received feedback through Skillshare but also through other artistic communities. 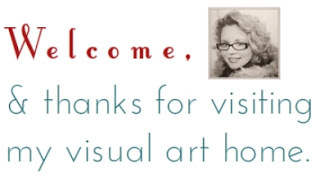 She also has just been accepted as an Artist in Cellophane (exhibiting Art-o-mat artist). Congratulations, Paige! Sara and Paige, please email me at nicolettaarnolfini@gmail.com. 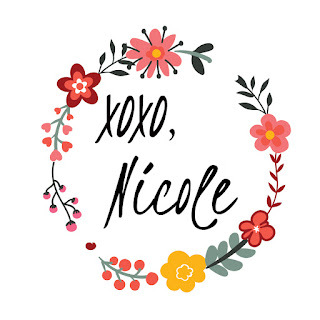 I will reply with your personalized Etsy shop coupon codes for a $25 purchase at P.S. Sweets. In the coming days, I will discuss my workshop students' work more and post pictures of their work. I always feel like I get so much more out of teaching than I put in. 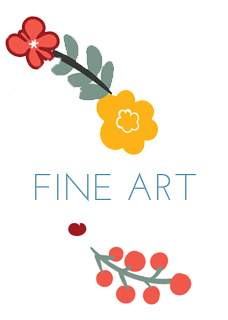 Stay tuned for another abstract art class this spring! One of favorite things to do is to visit an establishment that hosts an Art-o-mat machine. On this sunny Saturday, I'm in downtown Winston-Salem, NC, at Camino Bakery. My selection: Rachel O's Fabulous Whimsy: handmade button earrings. This Sunday, one of my students in my Skillshare workshop on abstract art will win an Art-o-carton, full of surprises. 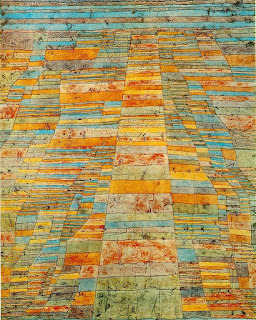 Each of the 10 works is handmade by an artist from around the world. Here is just a glimpse of some artists featured in this particular Art-o-carton. In my Skillshare class, "Abstract Art with a Twist," I use the terms "hard edges" and "loose" or "soft edges." These terms can be confusing and can vary somewhat based on the medium you choose. I wanted to share a bit with you about these definitions so you will feel more confident in understanding them and in using them yourselves. You can paint with hard edges, where the strokes are completely finished and defined. If you squint and stand a few feet from your work, these contrasting areas will stand out quicker than any other area in your painting. Allowing a coat to dry, and then painting the next application will help you achieve this effect faster. Hard edge can refer to brushwork, but can also summarize an entire style of modern painting. This style features contrasting colors next to each other. 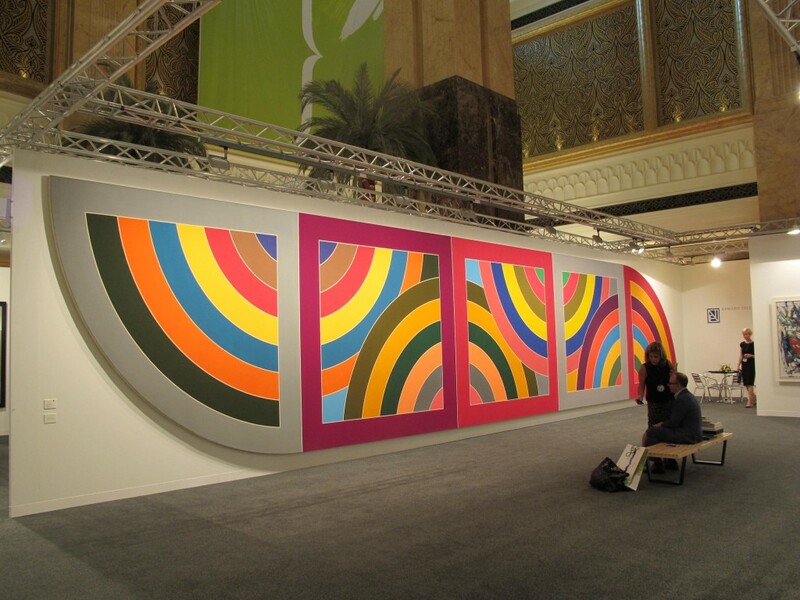 The artist would "finish" each pure color area with finished brushstrokes that were strong and final. 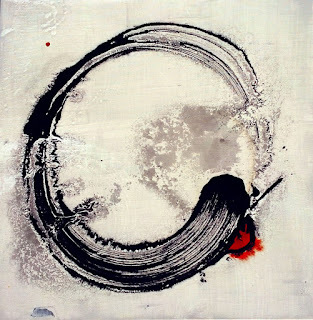 This style is often found in abstract painting and is easy to achieve in the acrylic medium. Sometimes I use "soft" and "loose" interchangeably. Generally, I'm referring to your choice to mix paints on the surface of the canvas instead of allowing contrasting colors to stand alone. You can paint with soft edges. In acrylics, you achieve this technique by painting wet-on-wet because you can mix the wet colors together on the canvas. You must work fast, because acrylics have a quick drying time. If you are working in watercolors, you can achieve this effect easily, and you have a little more time to play on the surface of the paper. Oils also have a much slower paint-drying time, so you have more time to investigate soft edges in this medium. You can associate blending colors with soft edges. Sometimes artists talk about "loose painting" with references to Impressionism. What they are saying is that the artist (example: Claude Monet) used loose brushwork to give an impression rather than a 100% faithful representation of what he saw. When you hear an instructor tell you to "keep your brushwork loose" or to "loosen up," this is the spirit of what they are saying. When I refer to loose work in my video presentation, I generally mean leaving a brushstroke open or less defined. If you paint digitally at all, you understand the difference between closed and open strokes. 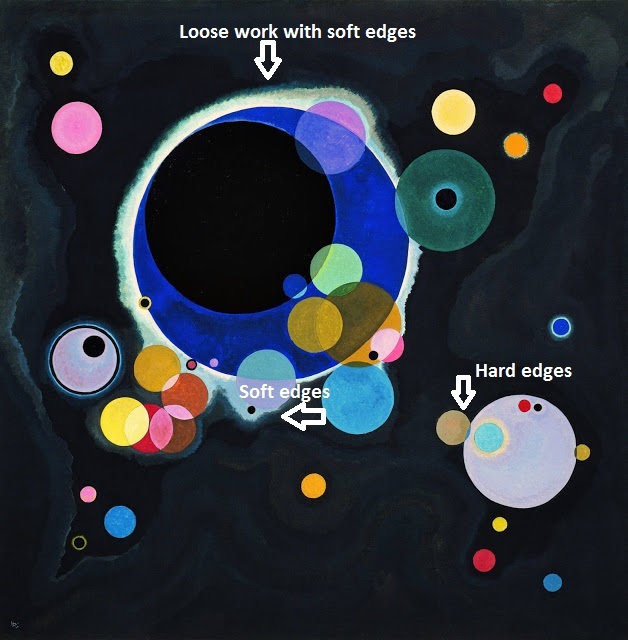 For those who do not paint digitally, I have mapped out some terms in Kandinsky's "Several Circles" painting from 1926, which is now in the Guggenheim Museum. Here is another artist's view on soft and hard edges. He even further defines lost and found edges, and he uses the mediums of pencil and of oil paints. I hope this helps you at least a little bit in understanding what artists mean when they talk about these terms. Please let me know if you have any questions, and happy painting! 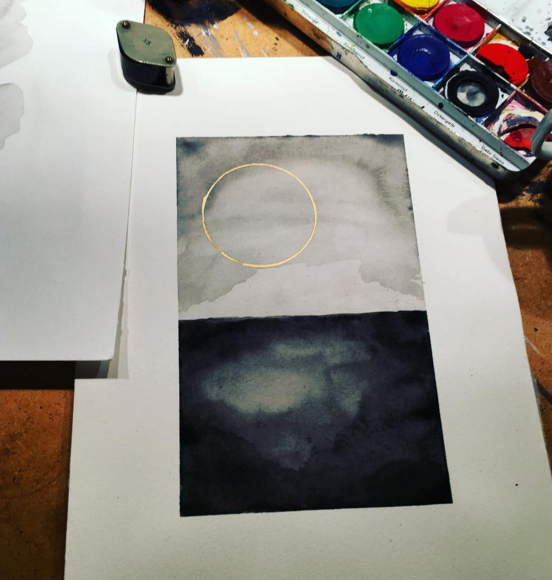 Now through February 27, my Skillshare students enrolled in my Abstract Art with a Twist class can work at a structured pace with daily emails that define steps to achieve the project goal. and two, $25 gift certificates from P.S. Sweets on Etsy. Hope/Despair, Ambition, Adventure, Love, and New Year/New Beginnings. I think the lower half of Stellan's painting above looks like a mysterious castle in mountainous forest at nighttime. 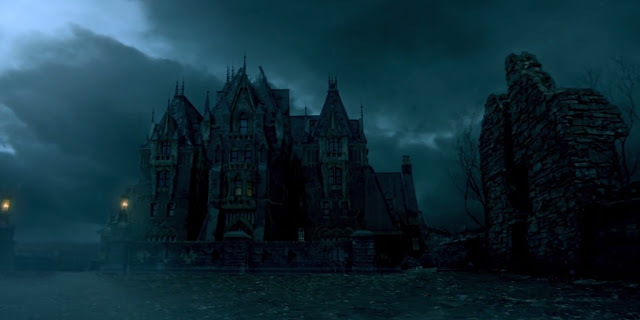 It reminds me of decadent horror film settings like those in Crimson Peak. More images from my class coming soon! 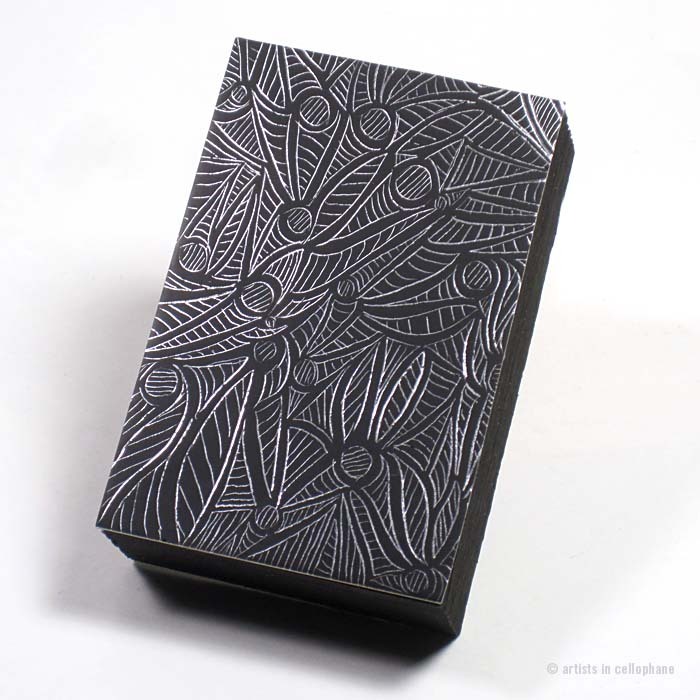 The beautiful Art-o-carton has arrived, and one lucky student from my Skillshare workshop will win this. I can't wait to see the projects that will unfold this exciting online teaching platform. My husband thinks the box is awesome. My kids thought the art was magical. They were all disappointed to find out that we can't keep this gem for ourselves -- that it's a giveaway for my class. We begin tomorrow with the workshop. 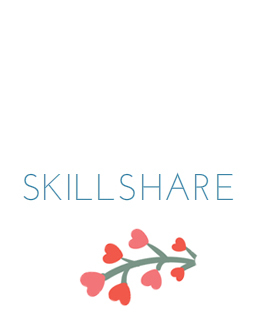 Make sure to join and to enroll in the class on Skillshare. More updates on class progress coming your way on this blog. This Valentine's Day, spend time with me doing what you love to do: paint and making art! 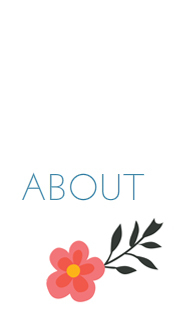 I began my first-ever online teaching adventure on October 31 through the Skillshare platform. Since November 1, I have enrolled about 190 students who want to learn about how to paint in the style and color choices of Wassily Kandinsky. It's easy to sign up to take an online class, but it's difficult to shut out the everyday noise and distractions. That's why I will kick off a two week workshop this Sunday, Valentine's Day. The workshop provides a structured, paced environment with lots of feedback from me for each student. What's even a better inducement to join the workshop? Did someone say amazing givewaways? 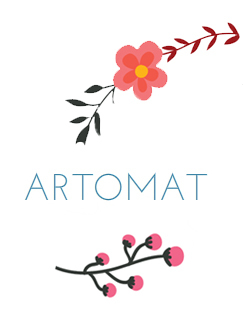 Yes, one fortunate (and hardworking) student will win an Art-o-carton from Art-o-mat. A carton holds 10 pieces of handmade, original artwork. If that doesn't inspire an artist, I don't know what does! 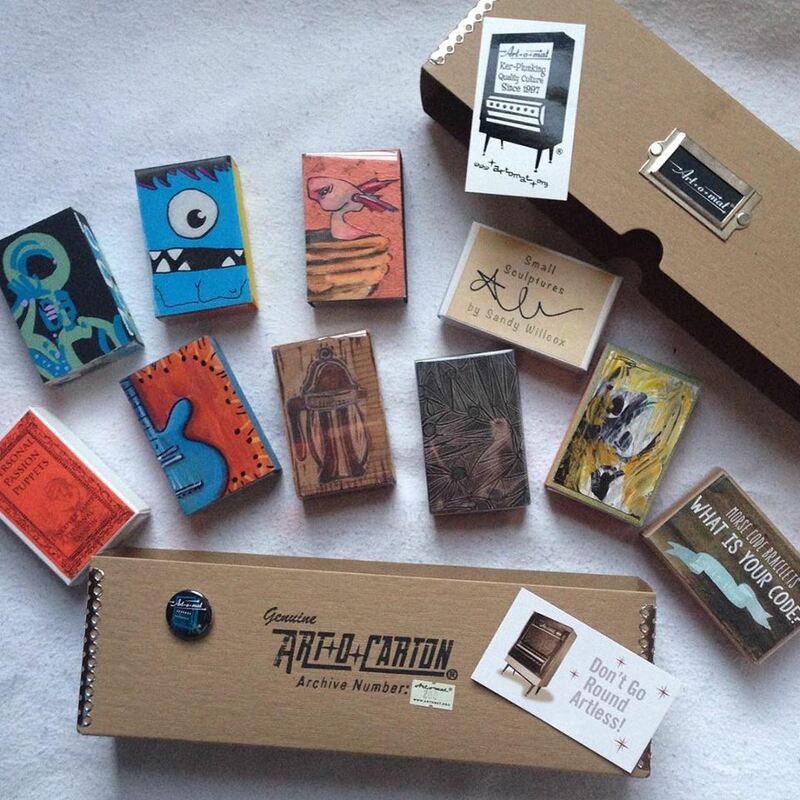 The Art-o-carton has a $100 monetary value and unlimited potential to ignite your creativity. But an artist needs more than this to insure creative success. 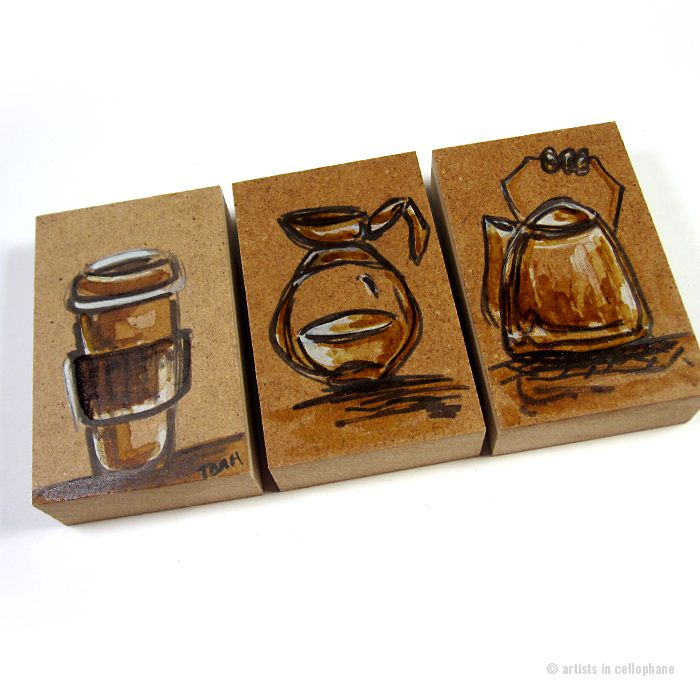 That's why I will give away two more prizes to two more participants who post projects from their workshop endeavors. 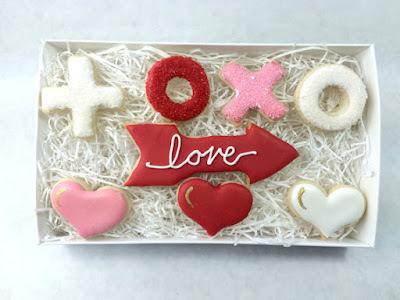 If you want delicious cookies, mouthwatering salted caramels or other delectable treats, then vie for one of the $25 gift certificates available from P.S. Sweets shop on Etsy. I will work along with you and post in the Discussion section of the workshop as well as the Community section of the class. Be sure to enroll in the class, post pictures of your project, and then wait to see who will be lucky enough to win one of these awesome prizes. "So, wait," you say, "What's in it for me?" Let's review. Be sure to enroll in the class and then the workshop. See you Sunday!